1 On January 1, 2017, the minimum wage will increase to $10.50 per hour. 2 On January 1, 2018, the minimum wage will increase to $11 per hour. 3 On January 1, 2019, the minimum wage will increase to $12 per hour. 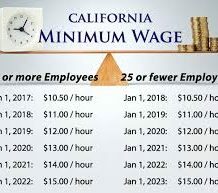 4 On January 1, 2020, the minimum wage will increase to $13 per hour. 5 On January 1, 2021, the minimum wage will increase to $14 per hour. 6 On January 1, 2022, the minimum wage will increase to $15 per hour. There is a delay for small businesses to implement the minimum wage schedule.. Specifically, the above schedule is delayed at each step by one year for employers with 25 or fewer employees. Public employers will also be less impacted by these changes than private sector employers will be. However, K-12 school districts must comply with state minimum wage law. This is because a Court of Appeal decision from 2010, (Sheppard v. North Orange County Regional Occupational Program), considered whether the Industrial Welfare Commission (IWC) could impose a minimum wage on the public sector and held that it could for a K-12 school district. California employers must also be aware that the “primary duty” test still applies to the determination of an employee’s exemption status. California’s standard is different than the federal standard. The state standard requires employees to be “primarily engaged” in exempt duties to qualify as exempt. This means that more than 50% of an employee’s time must be spent engaging in the activities that earn the exemption. So even if a California employer pays someone enough under the federal and state standard, it may still not qualify employees as exempt under California law. The new DOL rule also raises the salary threshold for highly compensated workers (subject to a different duties test) from $100,000 to $134,004. This is equal to the earnings of the 90th percentile of full-time, salaried workers nationally. However, California does not have the same or a similar exemption, and therefore employees who may be exempt under the new federal law may not be exempt under California law. When it becomes effective on January 1, 2017, SB 3 applies the new minimum wage broadly to the public sector, defining covered employers to include “the state, political subdivisions of the state, and municipalities.” Charter cities and counties might have arguments on their side that they should not have to abide by the minimum wage. Because of the changing legal landscape, employees should seek counsel to assist them in determining which minimum wage laws apply to them.